I am often asked when I first became interested in religious minorities, which in Italy means, for all practical purposes, any religion other than Catholicism. As far as I remember, I may date back the prehistory of this interest to 1964 when a leading Italian publisher, Rizzoli, published an encyclopedia known as Le grandi religioni del mondo (The Great Religions of the World, Milan: Rizzoli, 1964). You could go to the nearest kiosk and buy weekly installments for a sum roughly similar to fifty cents, then bind the installments in six richly decorated volumes. I decided I wanted to collect these installments – and still keep the volumes with their bright red covers. Although I now realize that they did include several mistakes, the photographs are still great to look at. I was, at that time, nine years old. Why exactly should an otherwise normal nine-years old spare some money to buy, in addition to his usual comics, the installments of “The Great Religions of the World” may seem largely unclear. I think that I had acquired an interest in “strange” religions from the travel accounts of my mother (a great traveler who came back from exotic places, from Bali to Polynesia, with artifacts whose meaning seemed to have something to do with religion) and from reading novels by authors such as Emilio Salgari (1862-1911), a novelist which largely defined Italy’s popular culture for several generations, and Rudyard Kipling (1865-1936). I had read all their novels dealing with India before I was ten, and the age was perhaps an excuse for not realizing that they were not the best guides to Hinduism and other Eastern religions. A later book which I remember as very influential was a novel for teenagers by Luigi Ugolini (1891-1980), L’isola non trovata (Turin: SEI, 1950), which featured inter alia Haiti and the mysterious world of voodoo. I borrowed this book from my junior high school’s library at age ten, and only recently managed to find a copy for the CESNUR library. With surprise, in re-reading it after more than forty years, I realized that the author’s picture of voodoo as barbaric and dangerous was not intended at all to make it look fascinating. But the novel was well-written, and at age ten I should have found the vodoo quite interesting without considering the implications. The second crucial event for seriously considering the study of religion was my attendance between 1970-1973 of an intellectually stimulating high school, Istituto Sociale, the Jesuit high school of Turin. This was the post-Vatican II Roman Catholic Church, and Jesuits came in all shapes and doctrinal variations. In 1972, while in that high school, I joined Alleanza Cattolica, a conservative Catholic group (and have never looked back – I’m still there), but the presence of ultra-liberal Catholic organizations (and Jesuits) in the same milieu created a continuous debate which benefited both me and other pupils of these years, who eventually went on to become well-known Italian politicians. Equally stimulating were, a few years later, another Jesuit institution, Rome’s Gregorian University, where I earned my B.A. in Philosophy in 1975, and the well-known Capranica College, often referred to as “the factory of Catholic Bishops” (in fact, many of my friends there did become Bishops), but which was starting opening its doors to laymen wishing to stay there while studying at the Gregorian. The latter institution was not only about Catholicism: a Chinese Jesuit offered, and I attended, some of the finest courses on Chinese religion and Daoism I ever came across. My interests were not confined to religion. While at the Gregorian, taking advantage of the intricate interrelations between the Italian and Vatican academic systems, I had already enrolled in the Law School of the University of Turin, where I became a Dr. Juris in 1979. My dissertation (on the American philosopher John Rawls, 1922-2002, which eventually became my first published book) was done under Enrico di Robilant, a fine scholar of philosophy and sociology who introduced me to the notion of the social construction of reality, including legal reality. It should be noted that at that time the University of Turin, as did most Italian universities, did not include a School of Sociology: the basic principles of social science were taught in a variety of other schools – including Political Science and Law. Rawls got me interested in the United States and on the interaction between religion, politics and society there. Following a family tradition, I had also spent my summers during both high school and college traveling around the world and visiting, in addition to many states of the U.S.A., the Middle East, India and North Africa, getting again in touch – although of course not very deeply – with a number of different religions. Towards the end of my college years I came to an important conclusion which was to become crucial for my future career – and for CESNUR. I decided that within the Italian academic system there was simply no room in the 1970s for a career devoted to studying contemporary religions different from Roman Catholicism (a few years later my wife, having graduated in Islamic Studies, came to the same conclusion: the only academic offer she received was not from Italy but from Louvain, Belgium). I didn’t want to give up the study of religion and decided to become an attorney, devoting however a substantial amount of time (roughly half) to religious studies, funding this interest from the income of what I hoped would be a decent legal career. This worked quite well, and in the next decade and beyond would allow me to donate to CESNUR whatever was necessary to make its ends meet. My final choice of intellectual property law as my preferred legal field also offered the renewed opportunity of traveling around the world, often joining visits to clients of my legal practice and others to religious groups and scholars in the same countries. The only other folks interested in minority religions in Italy were, then, Roman Catholic counter-cultists who dealt principally with the Jehovah’s Witnesses, who had been phenomenally successful in Italy in the 1960s and 1970s. They were of course not called counter-cultists at that time: I myself introduced the distinction between a Catholic counter-cult and secular anti-cult movement in 1993, based inter alia on personal experience. I was an active Roman Catholic, and didn’t have any initial trouble in co-operating with the counter-cultists. In fact I was one of the founders in 1985 of what is still the largest Italian counter-cult organization, GRIS, and was among those who legally incorporated it in 1987. It soon came out, however, that the approach I intended to adopt in studying minority religions was different from what the counter-cultists wanted to do. I was taught in college that one has to let any group at first speak for itself. When I asked a patriarch of the Catholic controversy against Jehovah’s Witnesses (an otherwise kind and good man) how many active Witnesses he had interviewed he responded none, and that he did not intend to do this. This was, to put it mildly, a serious methodological problem. When I noticed that something called the brainwashing theory, which I immediately disliked, was penetrating from the secular anti-cult into the Catholic counter-cult movement I decided that I should look elsewhere for a different company. A very important event was my discovery of the Mormon History Association (MHA), an international association devoted to the study of Mormonism, led by somewhat liberal Mormons but including several non-Mormons. I discovered that such an organization existed in 1986, by perusing journals in several Salt Like City bookstores during a visit I did there in connection with my legal business. Happily in 1987 the MHA was meeting, for the first time in its history, in Europe, in Oxford, and I decided to attend the conference. There, I met Jean-François Mayer, a Swiss historian of religions, and Michael W. Homer from Salt Lake City, who just as I did was dividing his time between being an attorney and studying issues related both to Mormonism and other minority religions (particularly Spiritualism). The Oxford conference was the start of long-lasting friendships and scholarly co-operations with both Mayer and Homer. I also met important figures of the Mormon history community such as Leonard J. Arrington (1917-1999), perhaps the most important Mormon historian of the 20th century, whom I interviewed several times in the following years and who was very generous with his suggestions and encouragement. Just as I was interested in new religious movements, at least one new religious movement did take an interest in my first endeavors. The Unification Church invited me to some of its events (I always paid my travel and accommodation expenses, as I would keep doing in the future), and the information I gathered in the process resulted in my first small book about a NRM, Il reverendo Moon e la Chiesa dell’Unificazione (“Reverend Moon and the Unification Church” – Leumann [Torino]: Elledici, 1987). Mayer had experienced similar problems in Switzerland in trying to co-operate with the Christian counter-cult community, and shared a dislike of brainwashing theories and anti-cultism. We decided we needed a new organization of our own. I approached a friendly Italian Bishop, monsignor Giuseppe Casale (soon to become famous, or notorious, as the most liberal Italian Bishop in matter politics – I did not share his political ideas but this did not prevent us from co-operating), who agreed to contribute some money and to host the new organization in his dioceses (first Vallo della Lucania and then Foggia, where he was transferred in late 1988). With his help, we organized the first CESNUR conference in Vallo della Lucania in 1988. The attendance did not exceed a dozen, and only three person (myself, Mayer and an Italian Roman Catholic priest, Father Ernesto Zucchini) presented papers. Undaunted, we went on and proceeded both to incorporate CESNUR and to call a second conference in Foggia for the same year 1988. In the meantime Mayer had attended several international conferences and, enlisting also the help of Mike Homer, we were able to bring to Foggia – and to CESNUR – the most famous international scholars in the field of new religious movements, Eileen Barker and J. Gordon Melton. We started learning about their respective organizations, INFORM and ISAR, and I tried to do something similar in Italy. Although not comparable to Melton’s, I had assembled a decent collection of books and ephemera on religious minorities and started organizing it with the aim of transferring it out of my home as the nucleus of a future library. Although we did not have the resources nor the prestige of INFORM, we were also interested in providing to the Italian media, law enforcement personnel and families reliable information about controversial minorities. These aims appeared more realistic when in 1989 and 1990 I published two volumes, for a total of some 900 pages, which were the first Italian encyclopedias about, respectively, new religious movements and what I proposed to call new magical movements, Le nuove Religioni e Il cappello del mago. The books sold quite well and I used the royalties to hire a secretary who welcomed visitors to my library and supplied some information. She was based in a room of my home, and that situation created family problems when a second child, a daughter, joined my first son in 1993 (two additional children would be born in later years). I then moved the library to an external office, and that move allowed the hiring, besides a secretary, of a scholar in residence. The first such scholar was Veronica Roldán, a sociologist from Argentina whom I had met at the CESNUR conference we organized in 1994 in Recife, Brazil. She then moved to an academic career in Rome, and we hired PierLuigi Zoccatelli, a fellow member of Alleanza Cattolica who came from Verona in 1996 and was a crucially important addition to CESNUR. 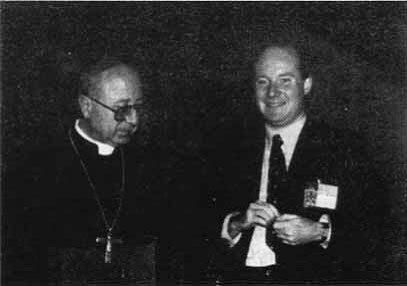 So were the creation of a Web site, in 1997, and the beginnings in the same year 1997 of a collection of short books on religious movements and denominations with the Turin Catholic publisher Elledici. This collection went on to include 42 titles, which sold in excess of 140.000 copies and were written by well-known international scholars including – besides Mayer and Homer – J. Gordon Melton, Karel Dobbelaere, Antoine Faivre, James Santucci, Mikael Rothstein, Susan Palmer, Margit Warburg, Jane Williams-Hogan, Connie Jones, and several others. By the end of the 1990s the large majority of scholarly books available in Italian on new religious movements were published by CESNUR, and a near monopoly had been established in the field, more for a lack of competition than in pursuance of a deliberate project. This prominence didn’t go unnoticed in the anti-cult community. Although our publication of a book in 1996 criticizing the French report on cults of the same year triggered the reaction, this would probably have happened at any rate. Anti-CESNUR criticism became a specific variety of anti-cultism, although it happened mostly on the Internet and was picked up by offline media only outside Italy and very rarely, if ever, by Italian mainline journalists who largely ignored it. Ironically, while the anti-CESNUR Web sites insisted in depicting us as “cult apologists” we, although crossing swords with the champions of the brainwashing theory when we had the opportunity of doing it, by the end of the 1990s were largely moving to other areas. What we had learned from years of fruitful interaction with the Italian media was that Italy lacked a reliable map of religious minorities in general, not only new religious movements. Italy, in particular, was home to the richest variety of Pentecostal bodies (and had the largest Pentecostal community) in Europe, but nobody had mapped this phenomenon, concentrated particularly around Naples and in Sicily. Immigrant ethnic Christian churches and Islamic movements also remained largely unmapped. We started collecting data on all religious bodies existing in Italy, and eventually published in 2001 the first edition of the 1,000-page Encyclopedia of Religions in Italy (the second edition would follow in 2006), which became the single most reviewed non-fiction books in Italy in that year. In 2001, of course, something else happened: 9/11, which in Italy as elsewhere diverted public resources and funding from the study of NRMs to the study of radical Islam. Unlike in France or the U.K., the scholars of Islam in Italy were very reluctant to study contemporary phenomena, preferring the safer waters of the first Moslem centuries. We had mapped Italian Islam, including its most radical brand, for the encyclopedia, and we regarded several Islamic groups as new religious movements within Islam. We decided, to some extent, to play by the new rules and produced several books and educational events about groups such as the Muslim Brotherhood or Al Qa’ida, in addition to general studies of the relationship between religion and violence. In 2003 something which for CESNUR was, in a way, not less important that 9/11 happened with the publication of Dan Brown’s The Da Vinci Code. This generated an enormous interest about secret societies and esoteric groups. We were fortunate in having at CESNUR PierLuigi Zoccatelli, a world-renowned expert of esoteric groups. On the other hand I had a long-lasting interest in popular culture and supernatural fiction (including comics). While it became clear that popular culture and comics were a worthy object of scholarly studies but needed a separate organization (hence the birth of CESPOC, the Center for Studies on Popular Culture), research on groups such as the Illuminati and the Priory of Sion mentioned in Dan Brown’s novels attracted unprecedented crowds to CESNUR events and landed my book on the matter, courtesy of Dan Brown, in the Italian bestseller list. The Da Vinci Code represented a unique opportunity and will probably not repeat itself, but the co-operation of CESNUR with the leading international scholars of esoterica (including Antoine Faivre, Wouter Hanegraaff, Jean-Pierre Laurant and Marco Pasi) remains an established feature of the Center and had started well before Dan Brown. In addition, and thanks to our co-operation with Rodney Stark, Laurence Iannaccone and other scholars of the so called “religious economy” persuasion, we started collecting data on secularization and on the meaning and future of religious pluralism in general. Some of our research is no longer directly correlated to NRMS, as evidenced by the project we completed in 2008, funded by an Italian bank, on Chinese immigrants to Turin, their daily life and their religion. Things change. Visiting the Chicago History Museum I learned about the fact that the first cellular phone, Motorola’s Cellular One (a big thing, larger and heavier than the average home cordless of today), was shipped from Chicago in 1983. The 25th anniversary was celebrated in April this year. True, the Japanese claim they sold cellular phones in Tokyo before, but that was not the same technology, and some Japanese claim they invented the spaghetti, too. Be it as it may be, I bought my first cellular phone only in 1991. CESNUR was founded by scholars with no cellular phones, no laptop computers, no E-mail. My children may not believe that a world without cell phones and E-mail ever existed, but this was the world or at least our world when CESNUR was born, only 20 years ago. This give us pause to consider the enormous changes in the last two decades, which have obviously affected how we see and study religion. On the other hand, we do believe that research on NRMs, anti-cult and counter-cult movements, and minority religions is still a needed task. While some “old” NRMs lose members, “new” NRMs arise literally every day and need to be studied. Those who deny that there is a future for the study of NRMs tend to ignore hundreds of new movements which have never been the subject of reliable scholarly studies. They may also ignore that studying NRMs has been for all these years, and remains, a lot of fun.